The Bay Area’s LGBTQ community has far more to celebrate than can possibly fit into one month of Pride—or even two months, including Oakland's Pride in September. 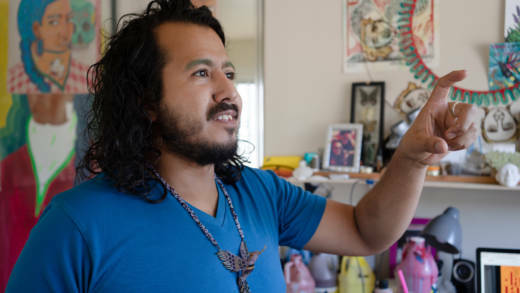 And for the visual artists profiled in KQED Arts’ series Redefining Pride: The East Bay’s Queer Artists, the work of creating greater visibility and acceptance doesn’t end with a dedicated month—it’s a year-long (and sometimes lifelong) pursuit. In this series, running every Tuesday for the month of September, KQED Arts contributor Emily Holmes highlights the work of queer-identified artists of the East Bay who are redefining our understanding of pride, foregrounding visual artists of color and a wide range of artistic approaches. For these artists, pride is about honoring the people and histories not necessarily included in mainstream presentations of the queer community. It’s about pride of place; how they’ve made homes for themselves and found their artistic support networks in the East Bay. And it’s about creating, through their work, platforms for not just their own voices, but spaces in which others can see their lives and their stories reflected. The artists of Redefining Pride are just four examples of the Bay Area’s extraordinary artistic talent, who can serve as introductions, we hope, to a thriving scene of ambitious, radical and queer East Bay-rooted art.